First, though the Treasury would most likely continue to pay its debt obligations to banks and foreign countries, they could have to stop, limit, or delay payments on a broad range of legal obligations, including Social Security and Medicare benefits, military salaries, just to name a few. Second, in the event of a default, America’s pristine AAA credit rating could be downgraded. That would lead to higher interest rates, which would result in much higher borrowing costs for the country. Higher borrowing costs are not good for growth, especially in a weakened economy. Unemployment rates would skyrocket as companies would be forced to close due to lack of credit from banks. The housing market would fall off a cliff as mortgages would become nearly impossible to obtain. Thirdly, it would most likely cause the value of the dollar to plummet. 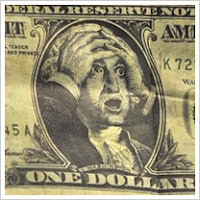 For the past few generations the US has had the legacy of being the safe harbor within the global financial system, and as a result the dollar is the world’s reserve currency. A debt default would destroy the world’s confidence in the US and a mass exodus out of dollars could occur. The collapse of the dollar would lead to a sharp increase in the cost of nearly everything, as more US dollars would be needed to pay for imports. Thus, inflation would be rampant. Last but not least, stock markets around the world could crash. That means that people’s savings and retirement plans would be obliterated overnight. Look for gold, silver, and other precious metals prices to catapult. As you can see, if the US defaults the situation could get real ugly. No one knows for sure what the exact ramifications would be if this situation comes to pass but it won’t be good. Let’s hope our leaders understand that these consequences are far too great and come to a compromise this weekend.